If in doubt, please give us a call on 0800 195 4453. We're more than happy to help you out on the phone. All Parcels delivered to UK Mainland, Scottish Highlands & Islands, Northern Ireland, Scilly Islands, Isle of Man, Isle of Wight & Channel Islands are just £4.99 for orders under £60 and FREE for orders over £60. Deliveries normally arrive next day. Exceptions to that are as listed below where a Next Day service is not guaranteed. 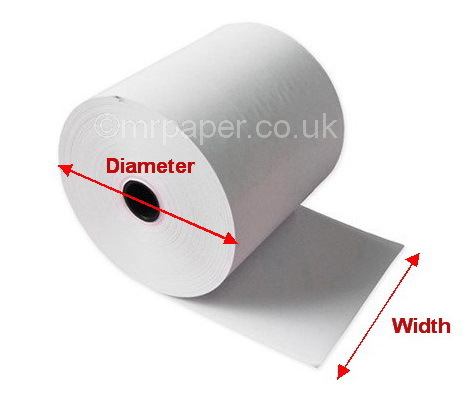 At Mr Paper we have been supplying Till Rolls since 1997 and have extremely good product knowledge. Our Rolls & Ribbons finder is guaranteed to be 100% accurate. If you are stuck, need advice or would like to speak to any of our very happy staff please call us on 0800 195 4453.